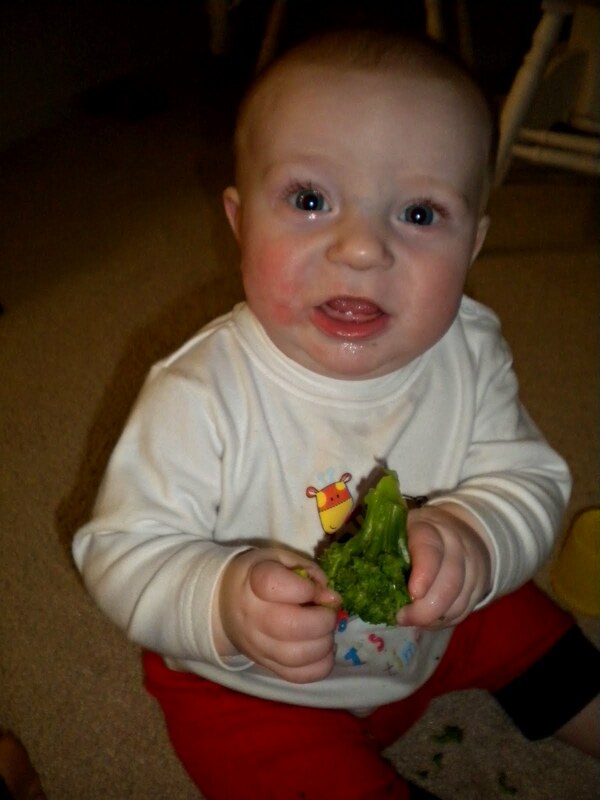 Who would have thought that broccoli would be a solution for a crying baby? Well, it cheered Mr. Landin up! While I don't think he fully enjoyed the deliciously healthy snack, he sure didn't hate it either! We did end up with broccoli all over our carper but that is nothing that can't be fixed! I love seeing Landin play and interact with his food. You can tell that he enjoys figuring out the texture, taste and smell of every single thing that we give him to munch on. On top of finding out that our son likes broccoli, we also went out on a nice family walk today! It was so nice out, I am fairly certain it hit 60* :) I am so excited for the Summer months, I love warm weather! tomorrow is an exciting day for us...February 28,2012- exactly one year from the day that we found out that you would in fact be a little Landin Gregory instead of a little Aunnalee Elizabeth (the name we have picked out for your maybe someday sister) We waited months for that day and we couldn't have been happier to find out that you would be you and you are the best you. We love you so much.